In my previous article I explained how I start a ZooKeeper Server (potentially more of them) in Java using the Observer pattern. As promised, in this article I will explain how I implement the starting of KafkaServers in about the same way. Again, using the Observer pattern. In principle we need one ZooKeeper, although you can have run multiple instances in a HighAvailable version. I have to figure that out, by the way. But we can have multiple KafkaServers. And that makes sense. You might remember that I'm planning to use Kafka in a Weblogic environment, where you can have multiple Managed Servers (for instance OSB or SOA) that run side-by-side in a cluster possibly on mulitple machines. You probably want to have the Kafka Clients (consumers & producers) connect to the local instance. I would. But, they should work together, exchanging messages, so you can track events that originated on the other instance. So I implemented a KafkaServerDriver extending the Observable class the same way as the ZooKeeperDriver in my previous article (I in fact copied it). I changed it in a way that it can start multiple instances of KafkaObserver. So, let me go over the particular metods again. This is essentially the method to start a Kafka Server. It begins with creating a KafkaConfig object, from a plain java.util.Properties object. 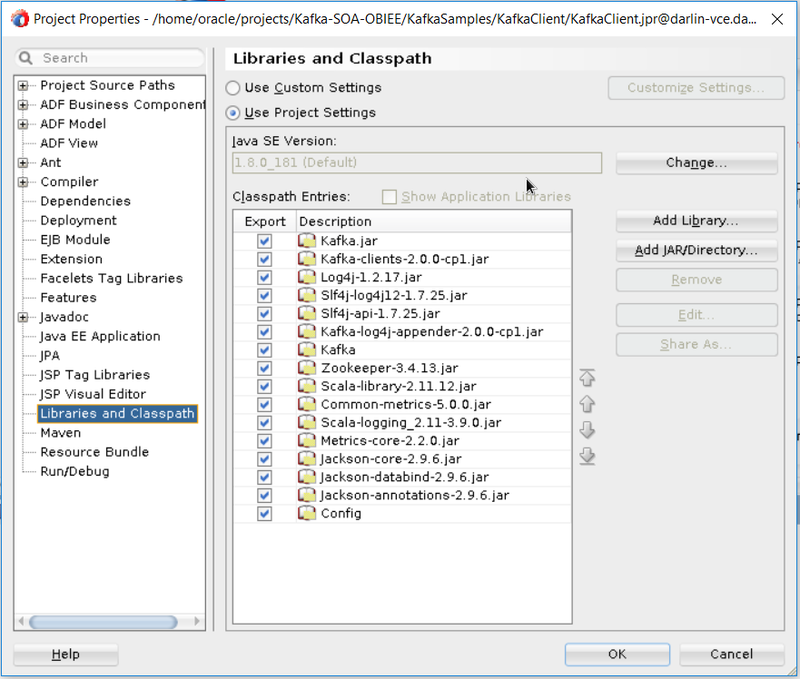 Again I created an own KafkaServer Properties class that extends the java.util.Properties object. In the ZooKeeper article I explained that I needed a few extra methods to get Int based properties or to default a property based on the value of another propertie. In this case another reason is that I want to be able to differentiate over KafkaServers, each having their own property files. We'll get into that later on. The KafkaServer(s) allow for injecting MetricReporters that can do reporting of ruintme behavior of the particular KafkaServer in a desired way. I did not get that to work in my JDeveloper project, since these are Scala object that JDeveloper got confused by, so to speak. So, in this version I provide an empty Reporters Array. Then we create a new KafkaServer object. The constructor expects the following parameters. config: the KafkaConfig object, created from the properties. new SystemTime(): a new org.apache.kafka.common.utils.SystemTime object. Option.apply("prefix"): Option is a Scala way of defining a Map (Kafka is build in Scala). The value "prefix" is used to give a name to the Thread the KafkaServer will run in. reporters: a list of reporters that can be provided to the KafkaServer, to monitor it. Note by the way that the KafkaServer apparently will spawn a thread it self, that it will give a name. In our Observer pattern we'll put the KafkaServer in our own Thread. To get a hold of the instantiated KafkaServer, we set it in our private attribute, and then startup the server. We can have multiple KafaServers running in our environment. We could have multiple on the same host, or distributed over multiple hosts. Each of them will have their own property-files, since, especially when running on the same host, they need at least their own broker.id and also their own port and data/log folder. To be able to differentiate over the different Kafka Servers and define which one of them should be started up on the particular host, I introduced my own KafkaServerDriverProperties file. <server-name>.propertyfile: naming a copy of the server.properties file that is used for this server. It it's loaded from the classpath, so only the name should be provided. <server-name>.startupEnabled: should the server be started on this host (true or false)? To work with this conveniently I added another properties class: KafkaServerDriverProperties. An object from this class fetched from PropertiesFactory.getKSDProperties();, where it is instantiated based on the kafkaserverdriver.properties loaded from the classpath. It transforms the comma-separated list into a List object, that enables you to iterate over it. And for each servername on the list it will get the propertyfile and startupEnabled properties and put that, wrapped in a properties object, in a HashMap, identified by servername. The getServerProperties(String serverName) method enables you to fetch those properties for a certain serverName. Having the above in place, the KafkaServerDriver Observable can be implemented with the ZooKeeperDriver as an example. But, since we want to be able to fire up multiple KafkaServers, this is slightly more complicated. It loops over the server names from the KafkaServerList from the KafkaServerDriverProperties. For each listed servername it will add a KafkaServer. This method has some overloaded variants. One parameterless, that loads the default server.properties file from the class path and calls the variant that takes in a properties parameter. What this does is pretty much equal to the addZookeeper() method in the ZooKeeperDriver class. Create a new KafkaObserver providing the KafkaServerDriver object (this) as a reference and the Kafka Server Properties object. And create a new Thread for it. New is (I didn't had that when I wrote the previous article about starting the ZooKeeper) is that I set the name of the Thread. Then I add the new thread tho the KafkaServer. We saw that in the addKafkaServer a KafkaObserver is instantiated using a reference to the KafkaServerDriver object as an Observable and the KafkaServer Properties object. In it we set the properties, and register the KafkaserverDriver and add this new object as an observer to the referenced KafkaserverDriver. It checks if the registered KafkaServerDriver has the shutdownKafkaServers indicator set. If so (and it obvious will), it will call the shutdown() method, mentioned earlier. As with the ZooKeeperDriver you need to store the KafkaServerDriver object in a static variable, and call the respective start and shutdown methods. 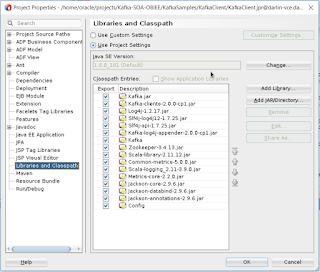 Using the mentioned KafkaServerDriverProperties file in the class path, the particular instance will know which KafkaServers need to be started. Make sure that for each kafkaserver you have a copy of the server.properties file as found in the Kafka distribution (for instance Confluent). Each copy need to have a unique broker.id and references to the data/log folders. And possibly a unique listen-port. One of the things I often miss in articles like this (my excuses that I did not add it to the previous article, is a list of libraries to add to get the lot compiled. Well, that's about it for now. Next stop: create a Weblogic domain and try to add the startup and shutdown classes to it and see if I can have ZooKeeper and KafaServers booted with Weblogic. And of course the proof of the pudding: produce and consume messages.